It can be a thrill to get behind the wheel of a vehicle that has power under the hood and performs well on the road. Today, drivers have more options than the typical muscle car when seeking this experience. The 2018 Ford Focus RS is a compact hatchback designed for performance and an exciting driver experience. The 2018 Focus RS brings many features to the table that come designed to give drivers a great driving experience. These include a powerful 2.3L EcoBoost I-4 engine that outputs 350 HP. 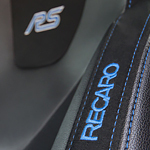 The Focus RS also comes with a brake system that incorporates an advanced cooling system. The front fascia which channels air, the front Brembo discs which are aerodynamically optimized, and the 19-inch forged alloy wheels work in tandem to produce excellent stopping power. Come to our showroom to learn more about what the new Ford Focus RS has to offer you and to take one out for a test drive. We are located at Baytown Ford.